Can you turn a Heineken drinker into the most talked about legendary man? The Contest is open to legal residents of France, Germany, Spain, Italy, Portugal, the United Kingdom, Russia, Mexico, Australia, Mainland China, Japan, Indonesia, South Korea Singapore, Brazil and the fifty (50) United States and the District of Columbia who are at least 21 years old at the time of entry. 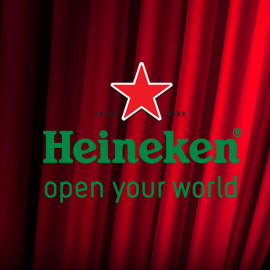 Heineken believes that some men are actors, not spectators. Heineken drinkers are men of the world, always ready to cross boundaries and confidently step out of their comfort zone. Whether it is music, art, science, sport or even the ability to make animal shapes with their fingers, Heineken believes every single man has a legendary side and is open to embrace the moment when offered the opportunity. Heineken wants to offer a platform, in any shape or form, to help Heineken drinkers showcase and celebrate their legendary side. Find a compelling, fresh and surprising idea that will help a man showcase his legendary side to others while creating buzz and getting people talking. Think outside the box: look beyond talent shows, TV campaigns, websites and viral videos. Your concept could be a publicity stunt, an event, a game or something totally different and new. Format: Presentations with pictures or illustrations and text, PDF format only. Don't forget to use our Discuss tab if you have any questions. You have till August 25th, 2013 to participate.